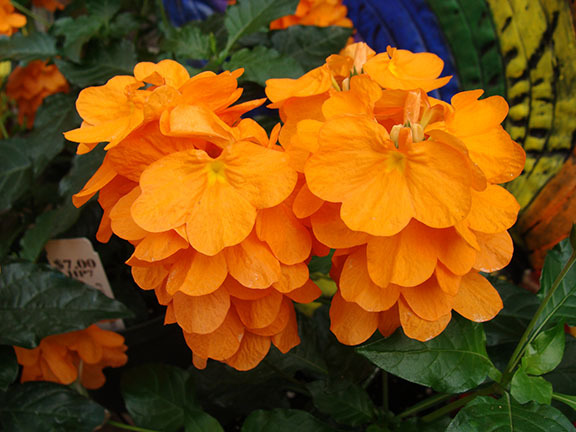 A great long-lasting color plant, Crossandra will bloom most of the year. They make wonderful houseplants with their glossy, deep green foliage that looks good even if they are not in bloom. When blooming, Crossandra plants put on quite the show with their spikes of bright orange, yellow, salmon, or pink blooms. The five-petaled blooms are borne on columnar square bloom stalks, which are unique in themselves and add a neat effect when the plants are covered in blooms. They are grown outdoors in tropical climates – butterflies are very fond of them and can be found visiting them for their delicious nectar. 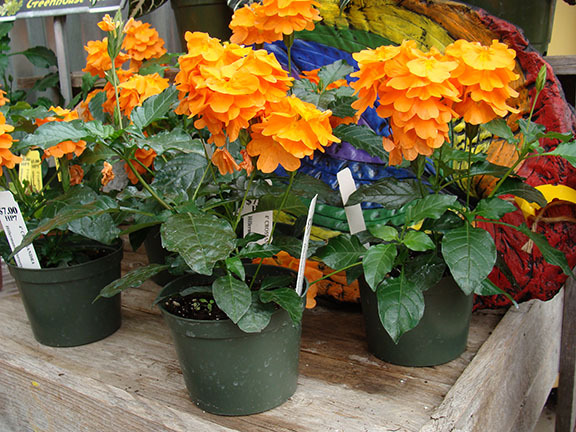 Crossandra plants need to be brought in for the winter or treated as an annual plant if placed outdoors in our area. 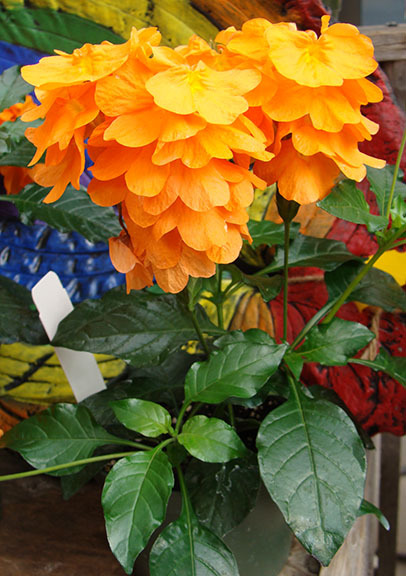 Plant Crossandra in a rich, peat-based potting soil with excellent drainage. Place in bright indirect sunlight (avoid direct sun in summer – provide as much light as possible in winter). Water frequently keeping the soil moist, but not soggy (water when the top layer of soil is dry – do not allow the soil to dry completely). Provide humidity by misting weekly or placing on a pebble tray with water at a level lower than the pebbles. Fertilize with a soluble tropical houseplant fertilizer in water according to the directions on the package throughout the growing season. Snip off the flower stalks at the base after the blossoms wilt and die. Repot the plant into a container one size larger every two to three years, or when the roots become crowded and begin growing from the bottom of the pot, at the same depth as it was in the old pot.